The release of the Beginners DVD this week reminded me of a story that Ewan McGregor told on himself when he came through San Francisco in April for that film’s opening night screening at the San Francisco International Film Festival. The conversation turned to Todd Haynes’ Velvet Goldmine and his role as Iggy Pop-like rock icon Curt Wild. For the actor, making the movie was a singular experience in which he got to sing live, dropping his trousers while singing The Stooges’ “TV Eye” during his character’s memorable introduction at an outdoor music festival and later performing “Gimme Danger” at Brixton Academy. “I really did it. I told Todd Haynes, ‘I’ll only do this if you let me sing live,’ and he did,” McGregor said. Several years later, he heard that Iggy was going be playing at a fashion show and he jumped at the chance to meet Curt Wild’s real-life counterpart. “I had never been a fashion show. It was back in the day and I was very, very drunk,” he recalled. 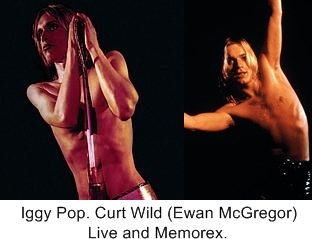 It didn’t dawn on him until he was backstage that Iggy Pop maybe hadn’t seen Velvet Goldmine and wouldn’t necessarily understand the connection between his legendary self and his eager (if tipsy) young visitor.